Heat oven to 425°F. Spray large rimmed sheet pan with cooking spray. In small bowl, make dressing by beating shallot, garlic, vinegar, lemon juice, thyme, 1/8 teaspoon of the salt and pepper with whisk. Slowly beat in olive oil. In large bowl, toss potatoes with 2 teaspoons of the dressing; season with 1/8 teaspoon of the salt. Place potatoes skin side up in single layer on pan. Roast potatoes 20 minutes. Remove from oven. 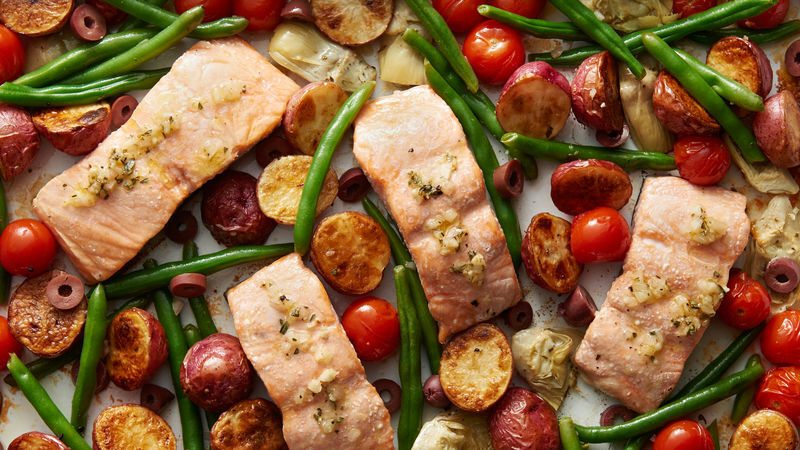 Turn potatoes skin side down, and make room for salmon, tomatoes and artichoke hearts. Place salmon skin side down on pan; drizzle with 1 tablespoon of the dressing, and season with remaining 1/4 teaspoon salt. In same large bowl, mix tomatoes and artichoke hearts with 1 tablespoon of the dressing, and toss to coat. Add vegetables to pan around salmon and potatoes. Roast 12 to 15 minutes or until salmon is cooked through, flakes easily with fork, and potatoes are fork-tender. Toss cooked green beans with remaining dressing (about 2 teaspoons), and add to pan. Place in oven 2 minutes. Top with olives. If some of your potatoes are larger, cut in quarters. Just make sure all your potato pieces are about the same size so they’ll cook evenly. If you don’t have fresh thyme, substitute 1/2 teaspoon of dried thyme.